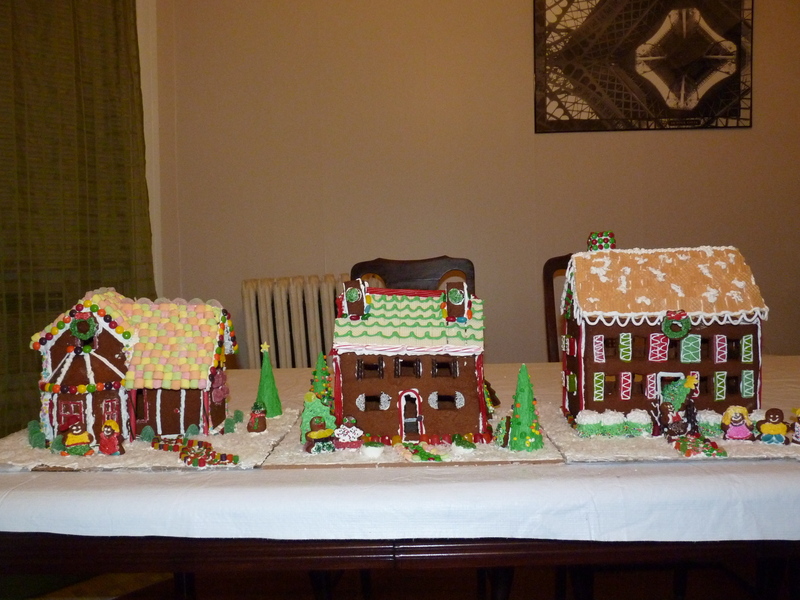 Last weekend was our annual gingerbread extravaganza. This year’s location was Bethany’s in Indiana. Fortunately the weather cooperated and made for an easy short drive for me! 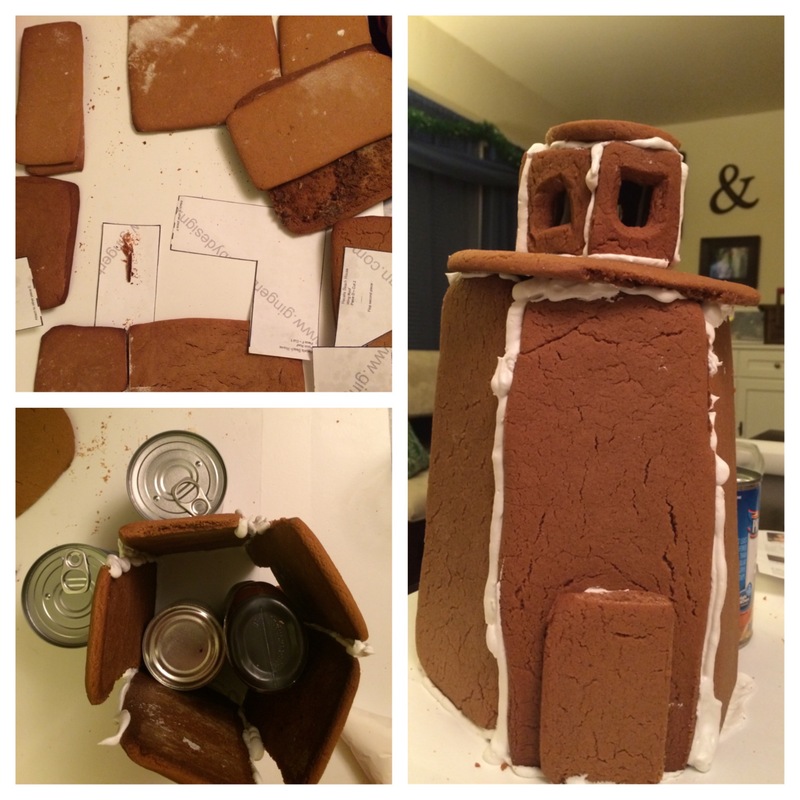 As you read in last week’s post, I was in charge of making the gingerbread. Which after some practice, actually turned out pretty decent. (Even by Jill’s standards!) We each had to pick up a few candy items as well. As you can see we had just a little candy to decorate all of our houses. This year was marked by a few interesting hiccups. When I packed for the trip, I placed each house in its own bag because I try to be organized. As we were getting ready to start, we unloaded the bags and low and behold, I totally forgot to make Bethany’s roof. Time for a quick trip to Jewel! We picked up Crisco and molasses and headed back to the house for some backing. Then we also picked up a gingerbread cookie cutter to make some people for the houses since Bethany didn’t have one and Jill and I both forgot ours. Another hiccup came when we realized that Bethany doesn’t have a Kitchen Aid mixer like Jill and I do, so we were reduced to making the icing using an awesome hand mixer. It was a great workout. The last hiccup was the actual icing. We’re sure it was either the 10-year-old cream of tartar or the fact that we couldn’t get the icing to lose its shine due to tired arms that it wasn’t quite as cement-like as it should have been. But that didn’t stop us. With the house smelling festive after baking the gingerbread, we finally were ready to start. Bethany got out all of her soup cans for us to begin icing and making sure our buildings wouldn’t collapse. The cans definitely helped since our icing was not solidifying. Luckily, we were still able to get everything done Friday night. Saturday was dedicated to decorating. Once the Pandora Christmas station was playing and breakfast was over, we worked straight through until about 4PM. Once again I was delegated to tree making and Bethany to the fine decorating of the faces on the gingerbread men. 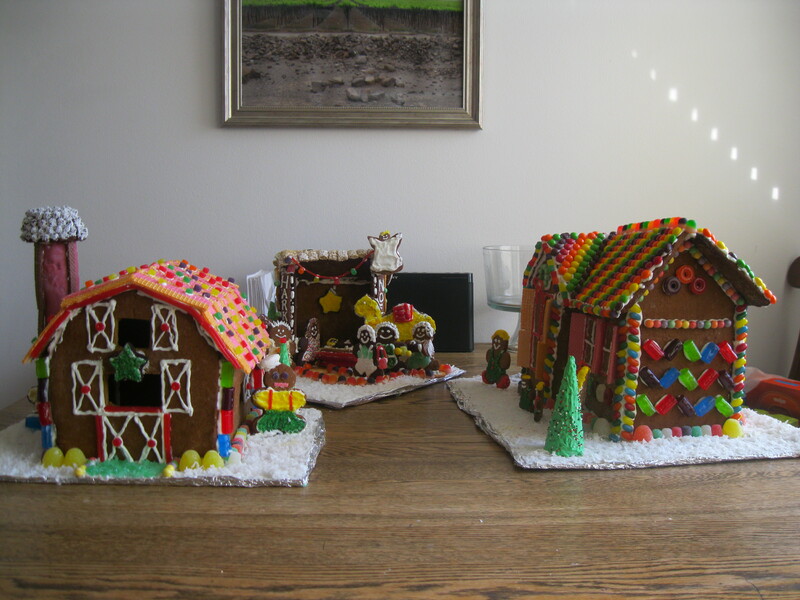 We finished a little earlier than normal because I made smaller houses than Jill had in previous years. I think they all turned out very well. Despite our hiccups, we managed just fine. Plus we had a great time catching up and thinking of ideas for next year’s extravaganza. What do you think? Check out the gallery below! 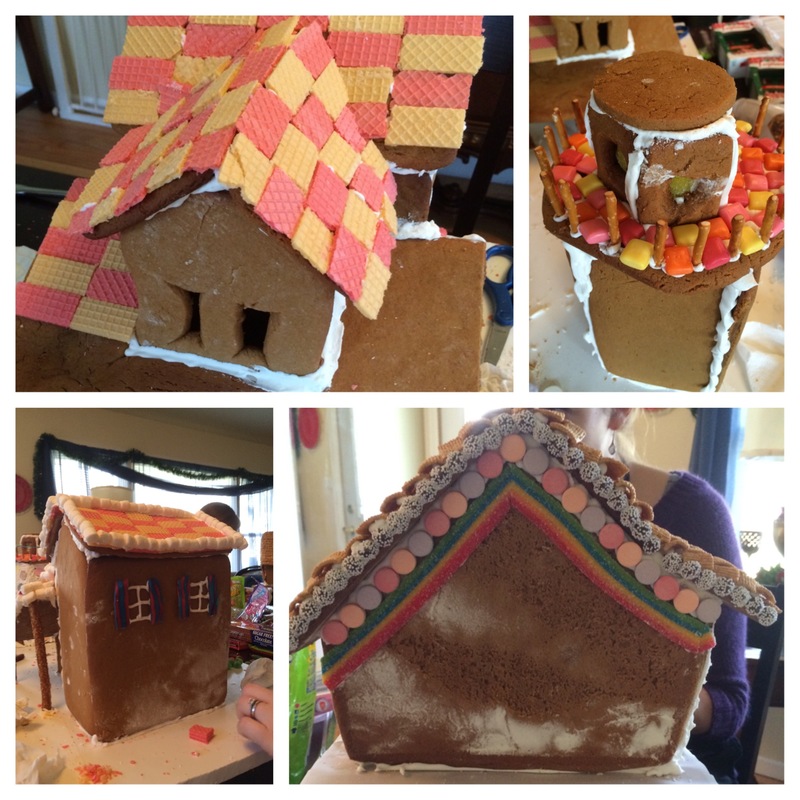 Pictures from the gingerbread extravaganza! Last week I shared one of my favorite holiday traditions with my family. This week it’s all about the gingerbread. 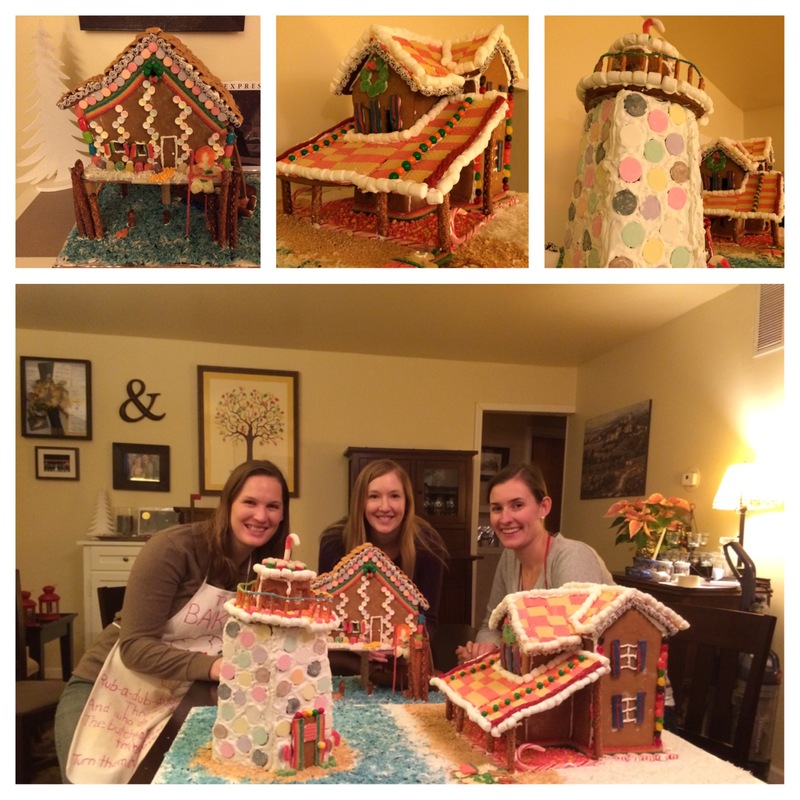 The annual tradition of the gingerbread creation extravaganza dates back to my senior year in college when my two sorority sisters and roommates, Jill and Bethany decided to make a gingerbread house. From that year forward, we’ve kept our tradition by picking a date in December where we can all gather for a weekend and turn mounds of icing, candy and gingerbread into a masterpiece. Each year, the location rotates between our respective homes in Illinois, Indiana and Michigan. Emails fly back in forth about who’s bringing what type of candy, eggs, powdered sugar, coconut and soup cans for “building support”. And the most important – what type of buildings are we making! Are we going to tackle houses, a train station, shops, post office, or a village hall?? •	Props to Jill for refining the recipes for gingerbread and icing each year. •	Remembering to put the houses together and let them dry over night before decorating. •	Too much candy and coconut is always better than not enough. •	Our creative cleverness has also expanded to making birdbaths from gumdrops and bushes from marshmallows. ..it always amazes me with what we come up with! Thanks to Bob “Villa” according to Jill, we went with different types of houses this year. Bethany undertook the Victorian manor, Jill mastered the colonial house and I was left with the simple salt house. I love the annual gingerbread creation extravaganza. It’s a time where I can catch up with my friends, drink wine, and think outside the box of candy.